The Big M4 Myth: ‘Fouling caused by the direct impingement gas system makes the M4/M4A1 Carbine unreliable.’ | DefenseReview.com (DR): An online tactical technology and military defense technology magazine with particular focus on the latest and greatest tactical firearms news (tactical gun news), tactical gear news and tactical shooting news. All photos contained in this article were taken by Mike Pannone for DefenseReview.com, and are copyrighted. Mike Pannone and DefenseReview.com own the copyright on these photos. I fired 2400 rounds of M193 through a 14.5” M4-type upper receiver from Bravo Company Manufacturing (BCM) with no lubrication, and without any rifle-caused malfunctions. So; why can I get my direct impingement rifles to repeatedly do things that conventional wisdom says they can’t do? This article is not a direct impingement vs. piston driven operating system debate and does not discuss piston guns at all. It is specifically dealing with a 14.5”AR-15 upper receiver with .062” gas port that’s as close to a Mil-Spec M4/M4A1 upper as I could find on the civilian market. All I have ever asked and required of myself (and others) as a professional is that everything I say or write must be capable of being substantiated. I am asking some questions and giving my opinions, observations, and conclusions based on my own experience and testing. For years I have been told, and heard others repeat, incessantly, that the direct-gas-impingement M16/M4 family of weapons is flawed because they deposit gas and powder residue in the upper receiver, and thereby are inherently unreliable with hard use. That sounds good in theory. However, in practice, I have not seen nor experienced it with my guns as a special operations soldier or civilian instructor. Why is that? Why don’t I have said commonly referred-to fouling problem with even excessive use and minimum maintenance? When I returned from Iraq in 2005, I was a primary instructor on a rifle course with the Asymmetric Warfare Group (AWG). During that time as I have mentioned in previous articles I began a quest to find out what made the M4/M4A1 Carbine run well, and what stopped it from doing so. In that time I spent a year at the 82nd Airborne Division training with infantry units prior to their deployment on the Iraq surge. During this time, I saw every manner of malfunction and never saw a rifle that was not well cared for (the soldiers attending were more senior and specially selected, as well as being members of the highly disciplined 82nd Airborne division). Each time there was a malfunction, if possible, I would run over and observe what had happened, then write it down in my log book. What I eventually realized was that when magazine issues were removed, along with broken parts, about 80% of the malfunctions had been accounted for. The rest were failures to properly extract and eject, and failures to go into battery. That is where I realized my rifles were superior to the ones issued. The only problems I had experienced with my own guns were double feeds which are exclusively magazine caused. What’s odd is that I was using a civilian version of an M4 that was nearly identical to the ones used by the paratroopers of the 82nd. My rifle utilized a DPMS chrome-lined 16” M4-profile barrel with a Larue free-float forend rail tube. After that barrel was shot out I went to a Noveske 14.5” Afghan barrel, and then finally to a Noveske 14.5” N4 cold hammer forged, double-chrome-lined barrel. Aside from being semi-auto-only instead of select-fire (i.e. burst-fire or full-auto capable), and one having a barrel that was 16.1” vs. 14.5”, they were functionally the same rifle. The difference was that I used a heavier Sprinco buffer spring (correctly called an action spring), a DPMS Extra-heavy buffer (.2oz lighter than a Colt H3 buffer), and a 5 coil extractor spring with a Crane O-ring for added extractor tension. Those drop-in parts made my rifles obscenely reliable, and still do. The spring-and-buffer combo I use works in mil-spec-size gas port rifles (.062” as per NAVSEA Crane a.k.a. Naval Surface Warfare Center, Crane Division) with 14.5” or 16” barrels and a 7.5” carbine gas system. There are some rifles on the market that have smaller gas ports than the Colt M4 in its military configuration, so the spring and weight may not work in them, as they may cause short cycling issues. I had the luxury of shooting my rifle without maintenance in a training environment until it failed. I routinely went well over 2500 rounds with only a few drops of oil and a bore snake run through the barrel every morning. I was convinced there and then that fouling was not nearly the issue it was purported to be, and that the real issue was weak springs and a buffer that was too light. 1. Remove all visible oil and lubricant from the inside of the upper receiver. 4. Use a lower receiver with a Sprinco standard Blue spring and an H-3 buffer (I used an H3 because it was close to the DPMS Extra-heavy buffer I use in most of my rifles. After I had done that, I fired 2400 rounds of M193 through it in six sessions, often shooting it so hot that I could not hold the forend without gloves. The first of such sessions was in the presence of two Border Patrol BORTAC snipers, and it consisted of 330 rounds in 25 minutes. This included zeroing the optic so the bulk of the rounds were fired in a 20 minute period by all three of us. (Note: At the conclusion of this, I pulled the bolt carrier group out and held it by the lugs with my bare fingers. That’s another myth (to debunk) for another article. I did this a second time later during the test where I had shot the rifle so hot I needed gloves to hold the forend, then shot 120 rds in 2:35 and again held the bolt by the lugs with bare fingers.) The rifle had no issues other than some test magazines that did not feed the last round properly. Once those test magazines were removed, the rifle always locked to the rear on the last round fired and did not feel sluggish. With good magazines–I used USGI aluminum of various makes so as to replicate military use as closely as possible–there were no issues until I reached 2450 rounds fired. At 2450 rounds the rifle would not complete the recoil cycle due to the additional friction caused by the fouling and no lubrication, and exacerbated by the extra buffer weight. Once the rifle began short cycling, it did so every shot. In diving medicine, that’s called “dramatic onset of a symptom”. It was as though a switch had been flipped and the rifle just stopped working. At the failure point I replaced the H3 buffer with an H buffer, and the rifle ran reliably again. I finished the remaining rounds in the 6th magazine of the session, and continued shooting. At 2500 rounds, the rifle ran, although quite sluggish in counter recoil. Then, nearly on cue, the rifle stopped again, this time at the 2540 round mark, and the last ten rounds were accomplished by tap-rack (performing a tap-rack-bang drill) each time. Just to isolate the issue I put the BCG in another dirty but oiled upper of same design and it ran easily (with H3 buffer reinstalled). I returned the BCG to the original upper, oiled it, and the rifle immediately came back to life firing another 90 rounds smoothly and without issue (2630 total rounds fired for test + 30 in replacement receiver cited above). · When the rifles become fouled, they have more drag (friction) inside the upper receiver, which slows down the bolt carrier group. 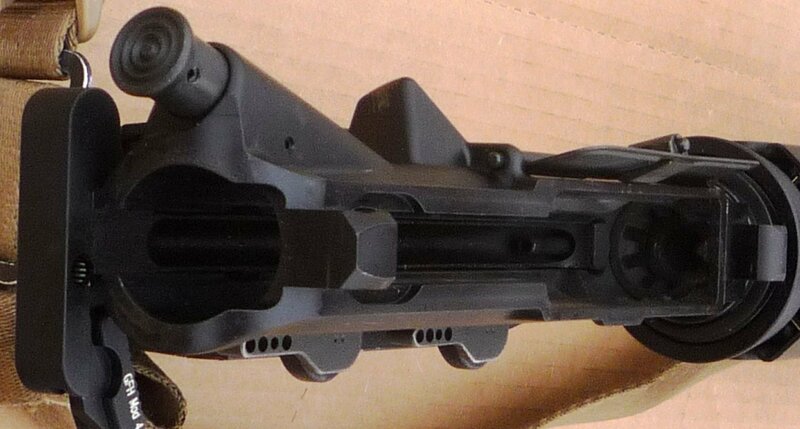 This along with the pressure on the bottom of the bolt carrier from a loaded magazine will slow the BCG down enough to keep it from reliably going into battery during the counter-recoil cycle. The heavier buffer and spring completely remedy this, but there is a crossover point. 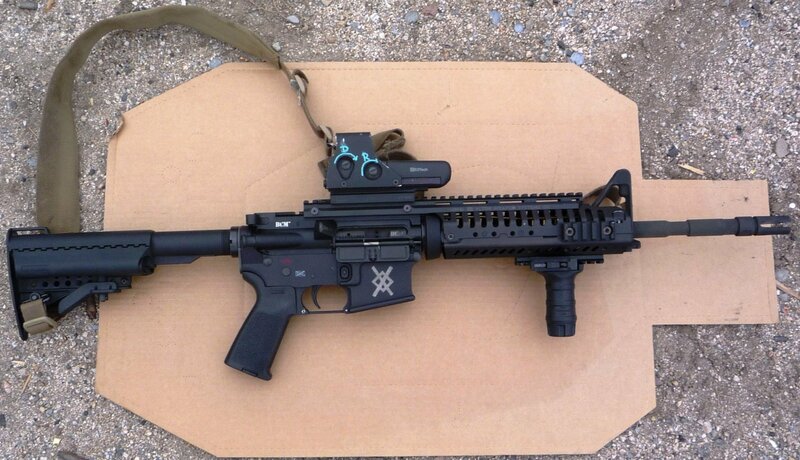 That crossover point on a bone-dry stock M4/M4A1-type AR carbine upper is about 2400rounds fired. 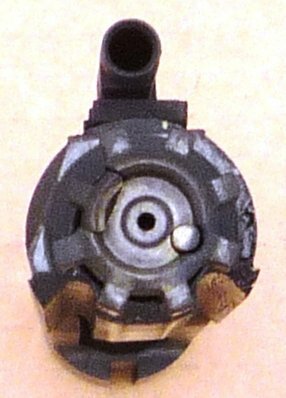 At that point, if there is enough buffer spring tension to drive the BCG into battery, then it cannot fully cycle. And, if the spring is light enough to allow the weapon to fully cycle to the rear, it does not have enough force to go fully into battery. The changing from an H to an H3 buffer only gave an additional 80 rounds of reliability. And, given the parameters of the test (no lube) and the dramatic increase in shootability using a heavier buffer, I am still a proponent of a buffer heavier than an H.
· With the Sprinco enhanced Blue action spring (or comparable extra-power spring) and an H2 orH3 buffer, unless there is a rigid obstruction present in the barrel extension, the rifle will reliably go into battery. Note: I routinely take “damaged” or discarded rounds (see first article on M4 reliability) that have been lying around or have deformed cases from the malfunctions block I conduct and load them into my magazines. I will shoot them all without issue, unless they are catastrophically disfigured or the projectile is pushed back into the case (creating a safety issue due to increased chamber pressure). The heavier buffer and added spring tension effectively resizes the case and fires it. · A benefit of the additional spring/buffer weight is that it slows down the unlocking and extracting tempo, increasing the locked chamber dwell time and allowing for much more reliable extraction and ejection. This is because the longer dwell time allows the chamber pressure to recede more, as well as transferring heat from the case to the chamber walls. It also offers a softer-shooting rifle because the recoil impulse is transmitted over a longer period of time, hence lower ft-lbs/second received at the shoulder. · With an enhanced extractor spring (BCM 4 coil, Sprinco 5 coil or comparable) and a Crane O-ring, I have not experienced any failures to extract except for faulty ammunition (specifically Radway Green training ammunition used by the 82nd in 2006) The SOPMOD bolt upgrade kit (new extractor and pin, 5 coil extractor spring, Crane O-ring and new gas rings), first fielded by SOCOM, should be standard on all M4’s used by the military or law enforcement. *I have heard of some rifles that will not function properly with both an enhanced extractor spring and a crane O-ring installed. The symptom is the extractor does not release the brass from the bolt face causing a failure to eject. I have never experienced this with my personal rifles, but am currently working with Lou Patrick of on finding the reason for this. Lou is one of the most overall knowledgeable gunsmiths I have ever met, and is also a former gunsmith for the Army Marksmanship Unit (AMU). **Test-fire any enhancements before fielding. Fouling in the M4 is not the problem. The problem is weak springs (buffer and extractor), as well as light buffer weights (H vs. H2 or H3). With the abovementioned drop-in parts, the M4 is as reliable as any weapon I have ever fired, and I have fired probably every military-issue assault rifle fielded worldwide in the last 60 years as a Special Forces Weapons Sergeant (18B). An additional benefit of the heavier spring/weight combo is that it transmits the energy impulse of the firing cycle to the shoulder over a longer duration, lowering the amount of foot pounds per second and dramatically reducing the perceived recoil. Follow-on shots are easier to make effectively, and much faster, especially at 50 meters and beyond. I reliably fired 2400 rounds (80 magazines) on a bone dry gun, and I would bet that is a lot more than any soldier or other armed professional will ever come close to firing without any lubrication whatsoever. So, disregard the fouling myth and install a better buffer spring, H2 buffer, enhanced extractor spring and a Crane O-ring (all end user drop-in parts). With normal (read “not excessive”) lubrication and maintenance, properly-built AR-15/M4 type rifles with carbine gas systems will astound you with their reliability and shootability. About the Author: Michael Pannone a.k.a Mike Pannone is currently the owner/operator of, and senior instructor for, CTT Solutions, which is a tactical training (including tactical shooting) and consulting firm. He's also a certified Colt Armorer. Mr. Pannone is a former operational member of U.S. Marine Force Reconnaissance, U.S. Army Special Forces, and specially selected elements of the Joint Special Operations Command. He has participated in stabilization, combat, and high risk protection operations in support of U.S. policies throughout the word as both an active duty military member, and a civilian contractor. During his military career, Mr. Pannone was the Distinguished Honor Graduate of a Level 1 SOTIC held at Ft Bragg. He currently instructs U.S. military, law enforcement (LE), and private citizens around the country as an adjunct instructor with several different organizations. He can be contacted via e-mail at [email protected]. © Copyright 2010 DefenseReview.com and Mike Pannone. All rights reserved. This material may not be published, broadcast, rewritten or redistributed without receiving permission and providing proper credit and appropriate links. Previous: Can IPS THINERGY Thin-Film Micro-Energy Cell (MEC) Automatic-Recharging Battery Technology Power the Future Soldier/Warfighter? Next: Smartphone Airstrike: Need to call in an airstrike? There’s an app for that. Need to kill bad guys? Just smartphone it in.